The Christmas season is one of the most awaited moments of the year. Everyone is into spreading holiday cheer and having a great time decorating their homes, and you certainly shouldn’t forget decorating the porch too! Your front porch is the first thing your visitors and you see when you get home. Join in the Christmas frenzy and try some of the tips below for a merry holiday ahead! Winter holiday lights makes such a huge difference. Whether you choose to go the minimalist way and just use string lights or opt for a full blown light-decorating spree, it’s bound to come out pretty! A dash of green, especially wreaths made from evergreens does not only look festive but also symbolize strength and hope, not to mention that it looks great on your front door! Poinsettias (particularly red ones) are the flower of the season. Use faux ones outside on the porch and real live ones at the front facing windows. They don’t only provide a nice decorative touch, they’re also associated with celebrating Christmas! 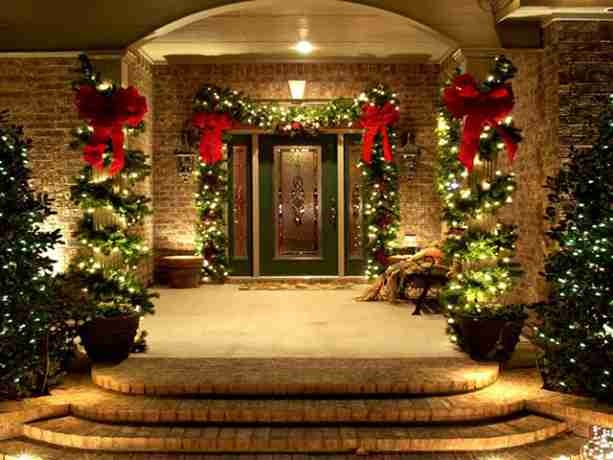 Often seen as an insignificant detail, doormats can be a key part of a beautifully decorated porch this season. Choose a Christmas-themed mat that can last through the holiday traffic and offers a decorative element too. Wrap your handrails, posts, and pillars with pine garlands for an instantly festive look. A few ornaments, some ribbons, and lights won’t hurt either. Consider adding a porch sitter such as a snowman, a stuffed reindeer, or a 3D Santa if you’ve got an ample sized porch or a swing. This adds a whimsical touch to your holiday décor and makes for a good spot for taking photos. Fake snow, huge snowflakes, or a stuffed snowman makes for a timeless porch décor. You can even go as far as adding spray snow to your front-facing windows together with some stick-on snowflakes. They’re not just pretty, they can somehow make your home feel cosier too! Go ahead and bring out an arsenal of decorations such as a full size Santa with some stuffed reindeers. Just make sure they are well-lit with some coloured lights to look extra fancy when it’s dark outside. Christmas candles (use hurricane lamps to protect them) are an awesome way to decorate and light up your porch. Just make sure they’re out of reach of any flammable materials plus children and/or pets for a worry-free joyful Christmas. Why Not Use a Christmas Tree? Christmas trees should not be confined to just the living room. You can simply decorate an outdoor tree or use a faux smaller version for your porch. Don’t forget to add lights, faux presents, and ornaments to complete the Christmas tree look! Love Christmas? Then you’d enjoy celebrating Christmas in Oakville! Our Town prides itself on providing fun, memorable experiences for its residents year-round, you’ll surely feel at home! Contact us to find a dream luxury home in Oakville!